Research in a foreign land and in a foreign language is almost always an exercise in frustration — for The Legal Genealogist as much as anyone. My father’s German family has been a source of amazement, joy and frustration, often simultaneously, since I started researching that side in earnest some years ago. And, more often than not, the frustration has won out. German privacy laws are strict, the records I can access often written in a German Gothic script that I can’t read. All too often this leads me to put that research aside — again — until the next time something comes up that makes me look at it again. Many times, the impetus to look at it again is this blog, and the schedule I set for myself to try to write something about my family every week on Saturday. Sometimes the specific topic is chosen because it’s time to renew a membership in a research society. Sometimes it’s about someone whose birth or marriage or death date is around the date of the blog post. And sometimes it’s because of both… like this post today. Because just recently I renewed my membership in Die Maus — die Gesellschaft für Familienforschung e. V. Bremen — the Bremen Genealogical Society. And today would have been the 120th birthday of the man who married my father’s maternal aunt. 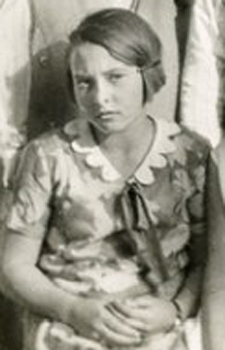 But that earlier research had brickwalled with the one child I knew about: the little girl identified specifically as Henni Thoms in a family photo labeled so neatly in my father’s handwriting as his mother’s family in 1932. Henni Thoms. His first cousin. My first cousin once removed. Now figuring that Henni would likely have been born no earlier than 1920, her birth record won’t be available before 2030. If she was even as old as 20 when she married — and German women tended to be a bit older than that on average — the marriage record won’t be available until 2020 at the earliest. And without a married name, I can’t even ask for a death record that I might legally be able to access. So Henni has always been one research target I’ve kept putting aside. When I was looking at the Thoms entries at Die Maus thinking maybe I’d find out something more about Heinrich for his 120th birthday. Oh… that record does say one thing more. Hello, cousin Henni… My first cousin once removed found… and lost… all in one record. I never saw a single death record where a married person is listed under married name in Germany. Not one. Always maiden name. So far. Listing under married name is a British world thing (anywhere where British once ruled.) Germany, France, Poland, Italy, Spain and elsewhere, they’re listed under maiden names on death records. Yet to see even one married name record. Your research and mine must be in very very different parts of Germany. Every German record I have for a married woman is in the form of Forename Married-Name geb. Maiden-Name, with geb. of course the abbreviation of geboren (born or nee in this context). My own great grandmother was Juliane Margarethe Nuckel geb. Schmidt in her death record, just as one example — and it’s indexed under Nuckel, not Schmidt. That’s likely to be a Catholic versus Protestant difference; Britain and North Germany are Protestant, South Germany and the other countries you listed are Catholic. And the frustration of the 4 given names used by my family interchangeable at their whim. Like you, I give up frequently and when something makes me think of it, I go back and beat my head against the wall. I heard the whoppee down here in Carpinteria Judy! I have ancestors in Bremen also and dread looking at the German script. I think I may need a course in the language before I consider calling the research a brick wall. My choice is much simpler: I just pay somebody to transcribe the records for me. I can usually translate them, most of the time, at least into workable English, but transcribing them is something I’d rather pay someone to do. OMG what a find! Gives me inspiration to look again for living cousins in my German lines.